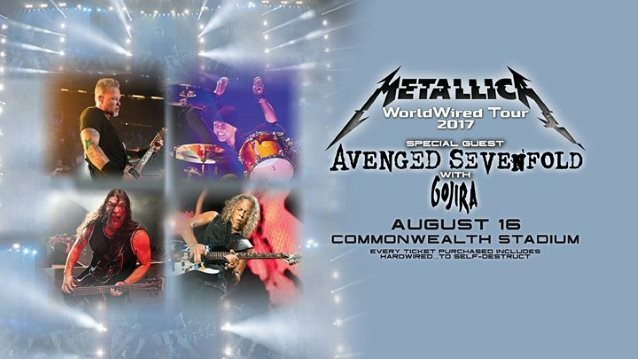 The final concert of the North American leg of METALLICA's "WorldWired" tour — which will take place Wednesday night, August 16 at Commonwealth Stadium in Edmonton, Alberta, Canada — will be streamed live on the webcast.livemetallica.com web site. Says the band: "What a summer!! Thank you to some of the craziest, most passionate, intense avid fans on the planet!! This has been another memorable and special summer run for us seeing so many new faces along with lots of old friends as you welcomed us back for our first tour of North America in over eight years. As we near the end, we want to share one more evening with all of you by streaming the final night of the 'WorldWired' North American stadium tour live, this Wednesday, August 16th, from Edmonton. "Grab a seat and a beverage as we'll come live to your computer, tablet, mobile device or any other way you reach the Internet on Wednesday at approximately 8:45 p.m. Mountain Time (10:45 p.m. ET / 9:45 p.m. CT / 7:45 p.m. PT). "Tune in as we say farewell to North America... for now (!)." METALLICA's current show is the band's largest production ever. Using 48 trucks, the stage takes three days to set up, equipped with lasers, balloons, more than 350,000 total watts of audio and a circular catwalk with a mini stage that the band plays "Seek And Destroy" on, aiming to recreate the garage atmosphere where it was written. According to Rolling Stone, the whole stage features 83 laser fixtures, which took 640 hours to program, and nearly 40,000 speakers for each production. Each night, they generate 2.5 megawatts of power — enough to power 1,800 homes for a month. 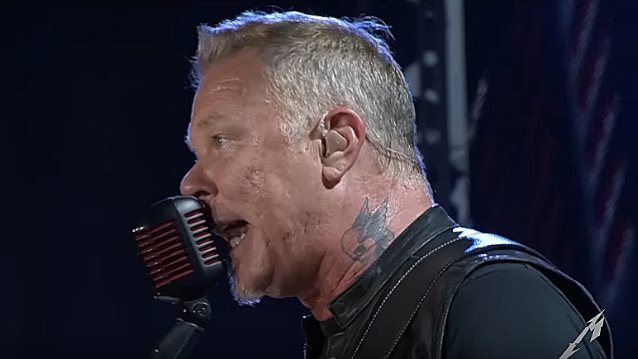 METALLICA frontman James Hetfield told the Nerdist podcast that the band would cap its live schedule starting in 2017 at around fifty shows a year. He explained: "My body has told me to tell these guys that fifty shows a year is kind of what we can do, so make the best of those. And I think we all kind of agree in that. But fifty shows a year, that's pretty good. My body can handle that. Body, mind and spirit all need to kind of revitalize themselves at home, and days off for voices — things like that — so fifty shows a year, it goes pretty quick, I'm sure."